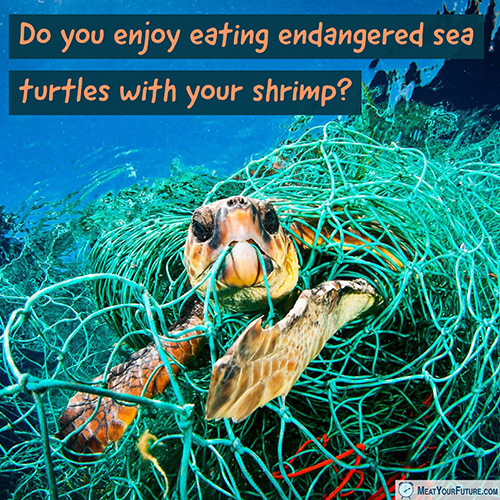 Do You Enjoy Eating Endangered Sea Turtles With Your Shrimp? For every 1 pound of shrimp caught, up to 5 to 20 pounds of unintended marine species are caught and discarded as by-kill. -United Nations Food and Agriculture Organization, “Discards and Bycatch in Shrimp Trawl Fisheries”. “If people knew that their order of shrimp cocktail came with a side of government-authorized sea turtle, they would be horrified. Yet, year after year, the federal government continues to allow tens of thousands of sea turtles to drown and die in shrimp trawl nets in the Gulf and Atlantic.” -Eric Bilsky, Assistant General Counsel for Oceana. In addition to the unsustainable demand for the “targeted” fish species that people eat, this immensely wasteful “by-catch” or “by-kill” of so many non-targeted species is a pervasive problem that is inherent in commercial fishing generally (not just for shrimp). The only practical protection for all species (including the endangered ones) is actually very simple — just leave animals and animal products off your plate (including marine animals). Why consume animal products, which result in environmental devastation, are unnecessary and bad for your health, and result in mass death and tremendous suffering to both targeted and non-targeted species? If haven’t already, please look into this important issues and go vegan — for the animals, for your health, and for the planet.